*Reissued in 1996 by Cold Chillin'/Warner Bros. Records. Contains 12 tracks. 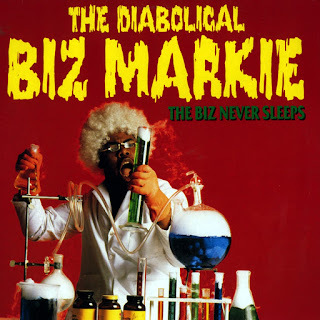 On the cover to The Biz Never Sleeps, Biz Markie's in the lab with his chemistry set, cooking up a concoction of colorful liquids that's bound to explode sooner or later. Inside, however, the music wasn't quite as dynamic; Markie decided to produce and write this record entirely by himself, instead of relying on help from Cold Chillin' beatmaster Marley Marl (who'd produced his excellent debut). The results veered dangerously close to the standard indulgent sophomore album, though Markie's natural charm and a blockbuster hit ended up carrying the proceedings. It certainly didn't start out very well, the opener being a long-winded "Dedications" that was little more than the title indicated, and "The Dragon," a one-joke track about odd smells. Rap fans with a sense of humor, however, were willing to forgive nearly anything after hearing "Just a Friend," the result of an intriguing story-rap interspersed with a bizarre bout of crooning that, once again, ably demonstrated how far Biz's charm could take him (in this case, all the way to the Top Ten). "Spring Again" and "I Hear Music" were yet more loopy productions with a universal theme, while Markie even sounded intoxicating while freestyling about a nonexistent dance over a simple loop ("Mudd Foot"). It was obvious the (teenage) lunatics had been released from the asylum; the wonders of visual technology allowed the Biz and T.J. Swan to have their thank-you lists superimposed, inside the credits, on their bared boxer shorts.